Connect up to 5 devices at a time via Bluetooth. 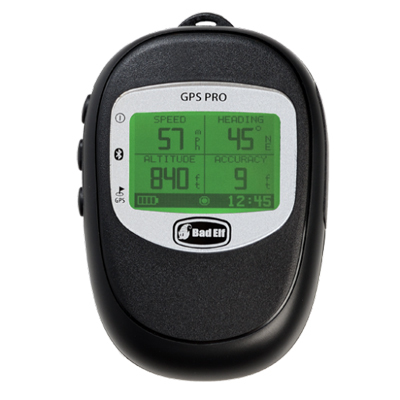 The real-time GPS data from a single GPS Pro can be used by up to 5 devices simultaneously – any combination of supported iPad, iPhone, or iPod touch devices. The entire crew can share the data from a single GPS Pro sitting on the glareshield or in the side window. Or share your GPS data with passengers in the cabin so they can follow the flight on their own iPads. Now you can record your adventures without draining the battery on your iPhone or iPod touch. No need to keep an app running, just start and stop the GPS Pro's datalogger using a simple button press. Discover something cool? Mark your current location as a point of interest (POI) with another button press. At the end of your activity, transfer the log to your iPhone, iPod touch, or iPad to view your trip and share it with friends and family via email, Facebook, or Twitter. The Bad GPS Pro meets all requirements under Apple's MFi program, and works great with any location-based App in the App Store including Jeppesen Mobile FD, ForeFlight, WingX Pro7, i1000 Flight System, iChart, Air Navigation Pro and more! The iPhone and the 3G models of the iPad include an internal GPS, however the internal GPS is made for use on the ground and is not very reliable in the air. You will find that you experience intermittent outages from the internal GPS while flying. The Bad Elf is a WAAS-enabled, super reliable and accurate, GPS receiver that you can count on both on the ground and in the air. Pros: Easy to use and connect via Bluetooth. Review: Very easy to use and performs exactly as advertised. Accuracy is very good and it's very easy to connect via Bluetooth. Excellent situational awareness tool that works great with ForeFlight. Highly recommended for a low cost GPS solution. Pros: Great GPS, I have had mine for years. Review: Great GPS. Not mentioned that it has barometric altimeter. Not so useful in pressurized cockpit, great in ultralite. Martin D from WA said in his review, "I don't like that the latitude and longitude are expressed in decimal form. This makes it difficult to reconcile Bad Elf positions with other devices which display degrees, minutes and seconds" but this is not true. From the app one can setup units displayed on the GPS LCD screen, including DD:MM:SS. >>>>DD.dddddd, or DD:MM.mmmm, or DD:MM:SS.ss, as one chooses. There is a different place for changing the units in the app. Pros: Easy to use. Small, light and convenient. Reasonably priced. It was delivered to me even sooner than mypilotstore's expect-by date. Review: I bought this Bad Elf Pro after buying a new iPad Mini 4 that didn't have an internal GPS. The Bad Elf connects to the iPad effortlessly. I put the Bad Elf in my shirt pocket, and it runs the ForeFlight moving map and Track Log, perfectly. The Bad Elf also has its own internal Data Logger, so it can be used by itself to record a flight. The recorded flight can then be transferred to my iPad and displayed on the Bad Elf app (available without charge) and on ForeFlight and Google Earth. I used this feature recently while doing transition training in a plane that was new to me. I didn't want to use ForeFlight during that training, because I was concerned it would distract me from what I was being taught. But I did want to have a visual record of the flights I took during that training, and I used the Bad Elf Data Logger to do that. Review: Worked well during flight. Review: I use it to provide location data to my I pad. It works as advertised. I don't like that the latitude and longitude are expressed in decimal form. This makes it difficult to reconcile Bad Elf positions with other devices which display degrees, minutes and seconds. Cons: A little hard to read info on the device itself. Cons: It has an LCD Display, but it doesn't display distance. If it displayed distance, the Bad Elf would be great for hiking and exercise. As is, it's necessary to download logged data to the Bad Elf app to see how far the user has traveled. Q: Does the Pro work with new IPad Air using latest OS 7.0.4? A: Yes, the Bad Elf Pro is fully compatible with the new iPad Air (5th generation iPad). Q: Once I buy the Bad Elf do i need a service plan to activate it? A: No, the Bad Elf Pro does not require a service plan and is ready to go out of the box! Q: I own the Ipad mini with only wifi. Can I use apples 'lightning- 30-pin adaptor' for the Bad Elf GPS 1000? Is the Bad Elf Pro my only choice with Wifi? A: The Bad Elf Pro connects and supplies GPS information via Bluetooth. Wifi will only be an issue depending on the certain apps you are using (if they require wifi or not) and does not affect the Bad Elf Pro's ability to communicate with your iPad. We currently only offer the Bad Elf Pro. Q: Does it work with EGNOS in europe or I'll just get regular low GPS accuracy without this ground based augmentation system? A: Yes, it will work with EGNOS. The Bad Elf has a 66 Channel, 10 Hz capable, WAAS compatible (SBAS/EGNOS/MSAS) GPS receiver. Q: Does the Bad Elf Pro work with the Ipad Mini? A: Yes, it works great with the new iPad Mini. Q: Will the bad elf work with any other devices but Ipads, such as android, blue tooth equipped hearing aids etc. A: No, the Bad Elf will only work with iPad, iPhone, and iPod Touch devices. For other devices such as Android or Windows you would want to get either the Dual XGPS150 or the Garmin GLO. Q: Is the bad elf pro compatable with the Ipod touch 5th generation? Yes, it works quite well with any of the "lightning" devices including the iPod 5th generation, the iPad 4th generation and the iPad mini. Q: Compatible with the iPhone5? A: Yes, this fully supports the iPhone 5. Q: I currently am using the Bad Elf GPS 1000. What advantage would thisBluetooth GPS have over the one that I own? A: The Bad Elf Pro offers a few things that the original Bad Elf doesn't. First it has a display that shows position information along with speed, altitude, and heading. The Pro also has a datalogging function so it will record your track or mark waypoints without actually being to your iPad. And, lastly it will allow you to connect up to five (5) iPads / iPhones at once whereas the original would only support one connection. And, of course, it is bluetooth instead of connecting via the Apple 30-pin connector.